For a democratic secular Iran. For peace and prosperity in the Middle East. : Appeasement of the Mullahs, Like Father, Like Son?! Appeasement of the Mullahs, Like Father, Like Son?! General Hassan Pakravan, the second chief of the Shah's secret police, SAVAK, had all the pedigrees needed to be regarded as an Iranian silver spoon fed aristocrat. His father was the governor of Khorasan province, amongst his many other titles and his mother, partly of European descent, was related to the Habsburg rulers of the Austro-Hungar empire. Pakravan studied most of his childhood and youth, studying abroad and finally graduated from the artillery school in Poitiers, France, and the Ecole d’Application d’Artillerie in Fontainebleau. Pakravan was appointed as the second chief of the Shah's secret police, better known by its acronym, SAVAK, after its first appointed chief, Teimour Bakhtiar, was removed when he became too ambitious and wanted to rule Iran himself. Pakravan's soft and compassionate nature was hardly suitable for someone who was supposed to lead a secret police organisation, he would have been more at home had he been appointed as the director of an art gallery or the national opera. It was during Pakravan's time as the chief of SAVAK, that Khomeini was arrested. Orders had come from the then Prime Minister, Assadollah Alam, to arrest Khomeini for instigating a bloody riot that opposed the Shah's progressive reforms such as replacing the feudal land ownership and granting universal suffrage to women and the religious minorities of Iran. During the time Khomeini was under house arrest in Tehran, General Pakravan visited him every week for lunch. According to Pakravan's wife, this was something Khomeini looked forward to and would say: "Timsar [General], I count the days to our lunches together." Pakravan, on the other hand, was literally petrified of Khomeini and totally awestruck by this stern puritan Shia cleric. "He makes my hair stand on end. It is frightening," Pakravan told his wife about his impression of Khomeini. When Khomeini was sentenced to death, General Pakravan, became upset and felt sorry for his weekly luncheon companion and missed their conversations about religion and philosophy. The Shah's General and head of the "bad, bad brutal" SAVAK decided he had to save his "friend". Perhaps he was hoping that by continuing his luncheon dialogues, he would change the Ayatollah's behaviour! Pakravan contacted the moderate, also soft natured, Grand Ayatollah Shariatmadari and asked for his help. Ayatollah Shariatmadari issued a decree that promoted Khomeini to an Ayatollah and Pakravan then convinced the Shah that he should not have an Ayatollah executed. Pakravan thus saved Khomeini's life and furthermore asked Turkey to grant asylum to Khomeini. Not that Khomeini showed any gratitude either to Pakravan or to Ayatollah Shariatmadari after he seized power. General Pakravan was amongst the first of the Shah's officials to be executed after the 1979 revolution had triumphed. Ayatollah Shariatmadari was also eventually put under house arrest and denied medical care, until he died in miserable conditions on 3rd April, 1986. 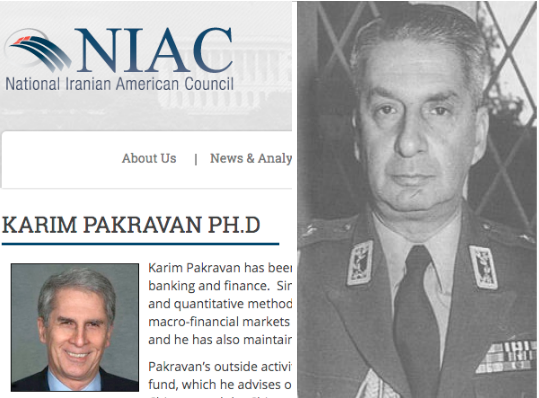 The fruit has not fallen far from the tree as it appears that General Pakravan's son, Dr. Karim Pakravan, is now continuing the same futile path of appeasement of the mullahs in Iran and has become a key fundraiser and advisor to NIAC, the lobby organisation that advocates appeasement with the Islamic Republic of Iran. Lets hope Karim Pakravan does not end up having the same fate as his father or help more extremists come to power like his father did!